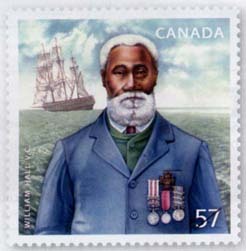 On February 1st, 2010, Canada Post began issuing a stamp to celebrate Black History Month. This year’s honoree is William Hall V.C. Mr. Hall was the first black person to receive the Victoria Cross. This medal is the highest military decoration awarded for valor in the face of the enemy. William Hall received his medal while serving in the navy, which is why, instead of the normal crimson ribbon, his Victoria Cross hangs from a blue ribbon. Mr. Hall took part in the relief of Lucknow in India, and was recommended for his outstanding bravery during that action. William Hall V.C. died in 1904 and was buried in Nova Scotia. I am confused first you name him William Nelson VC then you switch to William Hall VC? What name is correct? The correct name is William Hall VC. I made the correction to the article. Thanks.